Sample 1. Cross-functional flowchart - Trading process deployment flow chart. ConceptDraw DIAGRAM v12 is a professional diagramming and vector drawing software. Now, enhanced with SysML Solution from the Software Development Area of ConceptDraw Solution Park, ConceptDraw DIAGRAM v12 became an ideal software for model based systems engineering (MBSE). What is a Work Flow Chart? It is a chart which visually displays the step-by-step transferring of data, documents and tasks during the work. 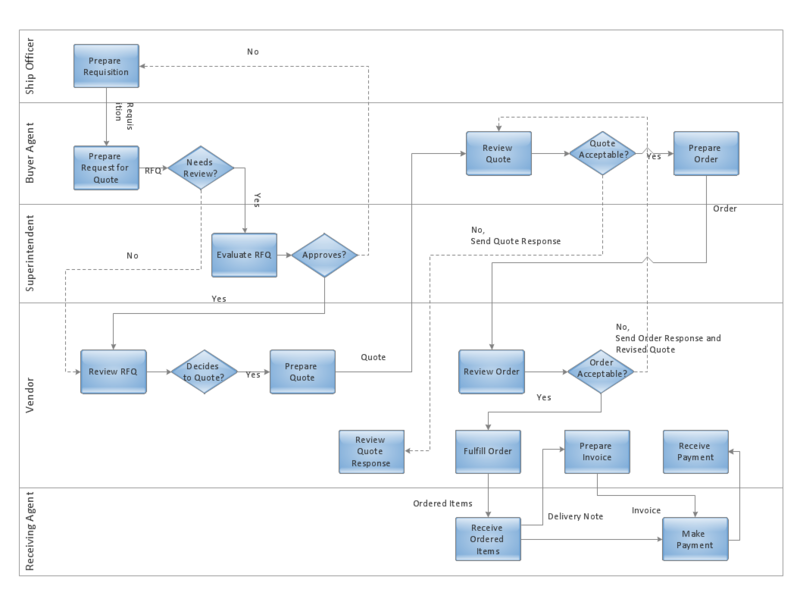 ConceptDraw DIAGRAM v12 extended with Workflow Diagrams solution from the Business Processes area of ConceptDraw Solution Park is the best software for drawing the Work Flow Chart of any complexity. The vector stencils library Yourdon and Coad Notation from the solution OOAD contains specific symbols of the Yourdon and Coad notation such as data store symbol, data process symbol, loop symbol for ConceptDraw DIAGRAM v12 diagramming and vector drawing software. The OOAD solution is contained in the Software Development area of ConceptDraw Solution Park.